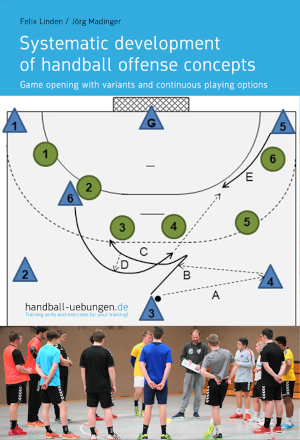 This is the second time Felix Linden (A-License and certified DHB young talents’ coach for competitive areas) gives insights into his understanding of diverse and focused handball training in the book series of handball-uebungen.de. Based on crossing of the center back and the pivot (circle) – which is part of almost every team’s repertoire in various forms – Felix Linden explains how you can create different game situations by using simple extensions and hence overcome defense systems with many variants. The individual training units deal with essential elements such as pulling apart a 6-0 defense system, authentic piston movements, pulling out a defense player, different shooting options, and decision-making. All training units focus on decision-making processes in particular. The training units comprise the standard playing structures with continuous playing options on both sides, variants with a second pivot and position switching as well as a variant for outnumbered game situations. Within the last few years, several counteractive defense measures have been developed in order to interrupt the back position/pivot circle. Consequently, it is important to practice different situations with regard to the back position/pivot circle. The last chapter shows various defense measures and provides an idea of which variants should be played in each situation.